The next day, anti-government gunmen took aim at that idea. A group of armed militants, led by the sons of Nevada rancher Cliven Bundy, stormed the Malheur National Wildlife Refuge, or NWR, in Oregon demanding that the U.S. government dispose of the national forests, wildlife refuges, monuments, and other lands that belong to all Americans. “This refuge, from its very inception, has been a tool of tyranny,” declared the group’s leader, Ammon Bundy. Through dangerous, illegal, and absurd means, the Bundy brothers’ stand—which lasted 41 days—brought into focus the most powerful philosophical and political attack on America’s parks and public lands since they were established. Bolstered by the rhetoric of sympathetic politicians, the anti-government anger of so-called patriot militias, and the financing of billionaire brothers Charles and David Koch, the Bundys and their allies seek to divest U.S. taxpayers of their public lands. They promise that, with the U.S. government out of the way, Western states could enjoy vast riches from unfettered mining, logging, livestock grazing, and energy extraction. Neither the law, economic reality, nor most Westerners support the fantastical—indeed, fictional—tale that Ammon Bundy, U.S. Rep. Rob Bishop (R-UT), Utah state Rep. Ken Ivory (R), and other leaders of the movement are telling to promote the seizure and sale of public lands. Yet the vision they articulate is so compelling that its true believers will stop at nothing in its pursuit. Anti-government extremists are intimidating—and perpetrating violence against—public servants, destroying public property, desecrating the cultural resources of tribal nations, and leading armed insurrections against federal law enforcement officials. Within the political system, they are pressuring state legislators to pass unconstitutional copycat bills that demand the turnover of national public lands to state control. The U.S. Congress has been a compliant witness to the rise of violent extremism on America’s public lands. The inflammatory rhetoric of some members of Congress has signaled to so-called patriot militias and anti-government activists that their complaints are legitimate and their goals justified. Congressional committees, meanwhile, have held only one hearing, organized no investigations, and enacted no policies to help reduce the growing risk that violent anti-government activists pose to public employees, public lands, and American communities. With its failure to act, Congress is tolerating a culture of violence, terror, and intimidation that has no place in American society. It is time for Congress to confront the dangers of anti-government extremism on America’s public lands, defend the rule of law, and reaffirm a set of shared values that will guide the stewardship of the nation’s parks, wildlife, and waters for the next century. As a first step, Congress should investigate the individuals and groups responsible for this wave of anti-government standoffs and attacks on public lands. The investigation should inform the development of new policies and investments to help law enforcement and U.S. land management agencies better protect public servants, Native American cultural resources, and public lands. Congress has the power and responsibility to investigate the threat of anti-government extremism to America’s public lands, public servants, and nearby communities. Since 2014, when Cliven Bundy led hundreds of anti-government militants in an armed standoff with federal law enforcement officials near Bunkerville, Nevada, anti-government activists have organized and led at least four other armed confrontations on public lands. In August 2015, Oath Keepers led a similar armed occupation of U.S. Forest Service land in Montana, blocking access to public lands and the White Hope Mine. During these armed standoffs and in separate individual incidents, public servants working for the BLM, the U.S. Forest Service, and other land management agencies have been the targets of violence. An independent review of BLM records found 14 incidents of violence against BLM employees in 2014 alone, ranging from attempted murder to threats of physical assault. During the armed takeover of the Malheur NWR, militants reportedly harassed, intimidated, and threatened federal employees, prompting the U.S. Fish and Wildlife Service to relocate the refuge’s entire staff out of the area for the duration of the standoff. Congressional leaders have failed to conduct any meaningful oversight or investigation of anti-government extremism on public lands. Neither the chair of the U.S. Senate Committee on Energy and Natural Resources, Sen. Lisa Murkowski (R-AK), nor the chair of the U.S. House of Representatives Committee on Natural Resources, Rep. Bishop, have held a single hearing on the topic. Chairman Bishop has instead held three hearings on “threats, intimidation, and bullying by federal land management agencies.” Eight separate committees held more than 20 hearings on the 2012 Benghazi attack, but since the Bundy standoff in 2014, the House Committee on Homeland Security has held only one hearing that included a discussion of the threat of domestic right-wing extremism; that hearing was prompted by the June 2015 shooting massacre in Charleston, South Carolina, allegedly committed by white supremacist Dylann Roof. The Senate Committee on Homeland Security and Governmental Affairs has held no such hearings in the past two years. Since January 26, the Federal Bureau of Investigation, or FBI, and state law enforcement agencies have arrested 25 anti-government militants on federal conspiracy charges for their participation in the armed takeover of the Malheur National Wildlife Refuge. Law enforcement officers shot and killed one additional militant, LaVoy Finnicum, after he fled arrest, nearly ran over an FBI agent with a vehicle, and appeared to reach for a loaded 9 mm handgun after refusing to follow police commands. On February 10, law enforcement agents also arrested Cliven Bundy at the Portland International Airport in Oregon as he was reportedly traveling to visit his sons, Ammon and Ryan, in jail. Cliven Bundy is among the 19 individuals that a federal grand jury indicted in early March on charges of conspiracy, assault, and making threats during the 2014 standoff in Nevada. Six of these individuals also face charges for their role in the armed takeover of the Malheur NWR. 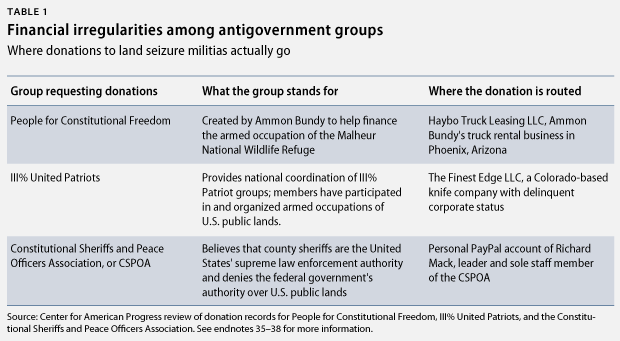 Following the armed takeover of the Malheur NWR, this militant arm of the land seizure movement has strengthened its ties with the movement’s political arm, led by the American Lands Council and the conservative Koch network. In early February, for example, the American Lands Council—a Utah-based group that has been the driving force behind legislation seeking to transfer control of U.S. public lands to the states—selected as its new leader Montana state Rep. Jennifer Fielder (R). Fielder has deep ties to the Militia of Montana and is a member of the Sanders Natural Resource Council, an anti-government group led by white supremacist John Trochmann. Meanwhile, former head of the American Lands Council Rep. Ivory announced that he will advocate for the state seizure of public lands through his new position with a group called Federalism in Action, which is funded by the Koch brothers. The Koch brothers also partly finance the American Legislative Exchange Council, which has helped Ivory and the American Lands Council disseminate copycat land transfer bills in state legislatures around the country. A CAP review of the fundraising efforts of the land seizure movement reveals several financial irregularities that merit federal or state review. In particular, several of the previously mentioned groups seek donations from the public as if they were charitable organizations, yet the contributions they receive appear to go to for-profit entities or individuals. People For Constitutional Freedom, the anti-government organization that Ammon Bundy created during the takeover of the Malheur NWR, accepts donations through the PayPal account of Bundy’s truck rental business, Haybo Truck Leasing LLC. Contributions to the CSPOA—which is closely allied with the Bundys, Oath Keepers, and other militia groups involved in the recent standoffs—go to the personal PayPal account of the organization’s leader and only staff member, Richard Mack. Likewise, the III% United Patriots, a national organization with state-level patriot group chapters—several of which sent members to participate in recent armed actions on public lands—routes its donations to a Colorado knife company called The Finest Edge LLC. “The Finest Edge offers knives and bladed merchandise from all name brand manufactures (sic),” reads its entry in an online business directory. “We also supply Tactical and Self Defense equipment.” According to the records from the Colorado secretary of state’s office, The Finest Edge’s corporate status has been delinquent since 2011. If contributions to these groups are going to for-profit businesses or individuals, the donations are likely subject to state and federal taxes. If these groups are instead claiming that the donations they receive are tax-exempt, however, then they must comply with state and federal laws for nonprofit organizations. 3% of Idaho, a patriot group that sent members to the Malheur NWR standoff, for example, claims on its website that it is a registered nonprofit organization and that donations to it are tax deductible, yet a CAP review found no record of the group in publicly available federal databases of tax-exempt nonprofits. As part of its investigation, Congress should ask the Internal Revenue Service to verify that each of these extremist groups is in compliance with federal tax laws. Congress also should verify that none of these groups is improperly using taxpayer dollars to advance their anti-government agendas. The activities of Ammon Bundy’s PFC, for example, raise concerns. According to the Arizona Republic, Bundy took a $530,000 federal loan from the Small Business Administration to start a company called Valet Fleet Service LLC. The loan cost U.S. taxpayers $22,000. The Arizona Republic reported that Valet Fleet Service is related to Haybo Truck Leasing, the organization that Bundy uses to collect money for PFC. Congressional investigators should verify that none of the federal loan money that Bundy collected for Valet Fleet Service was channeled through Haybo Truck Leasing or PFC to finance criminal activities at the Malheur National Wildlife Refuge. The federal agencies that manage U.S. public lands have too few rangers and law enforcement officers to adequately combat criminal activities in the vast swaths of national forests, national parks, and public lands with which they are entrusted. The U.S. Forest Service, for example, is stretched thin: Its 765 full-time law enforcement officials are responsible for 193 million acres in 44 states. The Bureau of Land Management’s 124 law enforcement rangers have even more ground to cover: They are responsible for patrolling 245 million acres of public lands. This means that there is only one law enforcement officer for every 3,000 square miles of BLM lands—an area bigger than the state of Delaware. In addition to confronting the threats posed by anti-government extremists, the BLM is combating large-scale marijuana cultivation on public lands in California, the looting of Native American artifacts in the Four Corners region, and thousands of incidents of theft and vandalism of natural and cultural resources. Congress should provide resources for the BLM and the U.S. Forest Service to expand their teams of law enforcement rangers. Some members of Congress, however, have been working to undercut the ability of land management agencies to uphold the rule of law. Rep. Jason Chaffetz (R-UT), for example, recently promised to introduce legislation that would eliminate all BLM and Forest Service law enforcement personnel and would instead give more power and resources to county sheriffs. Rep. Chaffetz’s proposal would fulfill a major objective of the radical “county supremacy” movement, led by Richard Mack and the CSPOA, which argues that county sheriffs are the highest law enforcement authorities in the United States, with constitutional powers that supersede those of the federal government. 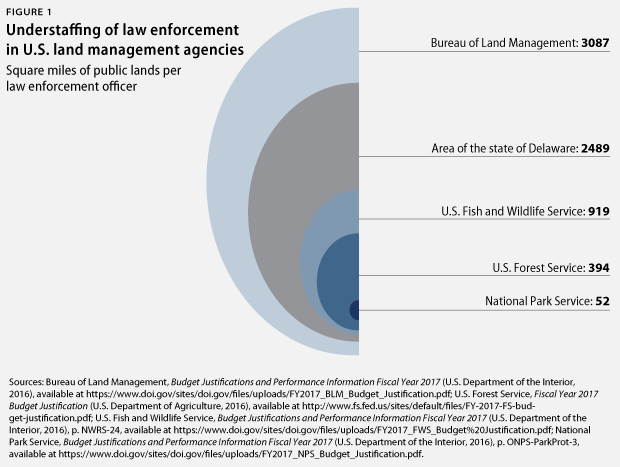 It is worth noting that, in addition to its members’ efforts to hamstring U.S. law enforcement authorities, Congress has slashed the budgets for land management agencies’ natural resource management programs. These cuts further weaken the agencies’ ability to protect the public and public resources by reducing the presence of traditional rangers and natural resource professionals in the field. Funding levels for resource management at the BLM and the U.S. Fish and Wildlife Service, for example, were lower in 2015 than they were in 2010. Congress should reverse this trend by providing agencies with the funding they need to hire natural resource professionals who can strengthen partnerships in communities, improve services for the public, and better execute the agencies’ core mission of resource stewardship. In addition to providing law enforcement officials with the resources they need to confront the threat of violent extremism on public lands, Congress should ask the GAO to conduct a review of the agencies’ preparedness and response policies for armed confrontations on public lands. The U.S. Department of Justice’s nearly two-year delay in arresting Cliven Bundy and his co-conspirators in the 2014 Nevada standoff allowed several of these same militants to organize and carry out the Recapture Canyon, White Hope Mine, Sugar Pine Mine, and Malheur NWR actions. The inconsistent responses of the FBI and federal land management agencies to the five armed takeovers since the beginning of 2014 suggest that federal law enforcement officials have no clear policy or strategy for how to respond to armed assaults on public lands. If Congress is to effectively respond to the rise of violent extremism on public lands, it must also confront its own members who are inciting the anti-government rage of militants and endorsing the radical ends that they pursue. Congress should be asserting its role in the democratic management of public lands, not abdicating its duties by selling them off. Yet instead, at least seven members of Congress emerged as powerful and vocal apologists for the militants during the Malheur takeover. Like Rep. Walden, Rep. Bishop blamed the armed takeover on public servants who work for U.S. land management agencies. “I want it to end without violence, but I also understand the frustration and feelings people have working with land agencies,” said Bishop. “They have been very heavy-handed.” Reps. Scott Tipton (R-CO), Steve Pearce (R-NM), Mark Amodei (R-NV), Cynthia Lummis (R-WY), and Raúl Labrador (R-ID) echoed Rep. Bishop’s argument that U.S. natural resource agencies are to blame for the militants’ anger. Notably, several of these members of Congress are seeking to pass legislation that would meet the militants’ demands for the federal government’s divestment of public lands. Less than two weeks after the end of the Malheur NWR takeover, the House Committee on Natural Resources, chaired by Rep. Bishop, took up three bills that would turn over millions of acres of national forests and public lands to private and state control. A congressional investigation alone will not stop the rise of violent extremism on public lands. Anti-government activists and militants have shown that they will use any means available to divest U.S. taxpayers of national forests, monuments, and other public lands. But Congress’ intervention would send a powerful signal of support to the law enforcement officials and prosecutors working to restore the rule of law and bring those accountable to justice. 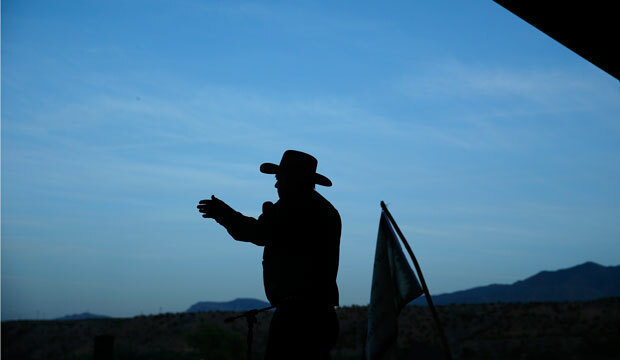 Investigators could also help shed light on the dark network of patriot militias, financiers, and special interest groups that are currently fighting to seize control of U.S. public lands. Just as importantly, Congress should provide park rangers, wildlife professionals, and U.S. natural resource agencies with the resources and tools they need to safely guard the natural and cultural resources with which they are entrusted and to continue to build the partnerships with local communities that are indispensable to sound public land management. By choosing to confront the dangers of anti-government extremism on public lands, Congress can reaffirm the nation’s shared commitment to the public ownership of U.S. lands, waters, and wildlife as the country enters a second century of American conservation. Matt Lee-Ashley is a Senior Fellow and the Director of Public Lands at the Center for American Progress. The author would like to thank Katherine Downs, Meghan Miller, Nicole Gentile, Jenny Rowland, Chelsea Parsons, and Khanh Tran for their contributions to this issue brief.